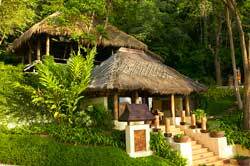 Levimarn Cottage & Spa - A unique tropical Boutique Resort for an idyllic stay that will call you back again and again. Clustered on the gentle slope of a hilly cove overlooking a quiet bay beach is your stylish retreat from the world. Supremely comfortable individual cottages all with balconies, some with your own outdoor spa that look down onto a peaceful curved bay of sparkling sea and fine sand. The cottage cluster centers around a superb infinity pool, a world class spa and a restaurant offering a most interesting and comprehensive menu. 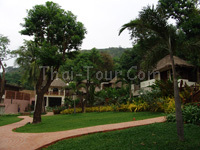 Le Vimarn attracts sophisticated and discriminating international guests year after year. A dream location that will last in your memory for a lifetime. 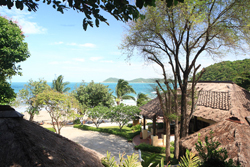 Le Vimarn occupies a wonderful beachside nestled into a lush hilly landscape overlooking a picturesque bay beach of deep azure blue. Here, you will find quiet places to laze in the sun untroubled by venders and the sight of hundreds of obtrusive deck chairs. Beach service is yours for the asking with comfortable beach lounges, umbrellas and even beachside massage if your request. Water sports, too, are there for your enjoyment. But best of all is a quiet stroll along the shore at sunset. Truely unforgettable. - Round trip hotel Shuttle speed boat transfer from/to Seree Ban Phe Pier to Koh Samet. - Please mention "WEEKDAY / WEEKEND PROMOTION" in your voucher when make the reservation. - THe special rates applicable to new bookings on Sunday - Thursday only and CANNOT RE-BOOK. - Please mention "SPECIAL Weekday Promotion" in your voucher when make the reservation. * Extra bed can apply on bonus free night and charge breakfast fee on free night. • Peak season surcharge of 1,200 Baht/room/nigh on Chinese New Year: 08-12 Feb 13 and Songkran Holidays 12-16 Apr 13. • Stay a minimum of consecutively 3 paid nights, get additional 1 night free on roon only i.e. 3+1, 6+2 The compulsory ABF is chargeable to the rate. This special offer is applicable for Deluxe Cottage, Spa Villa. • Fruit & flower in-room decoration upon arrival day. 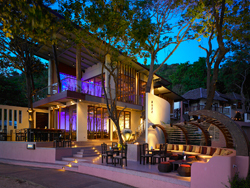 • Stay minimum 3 nights get one set dinner for 2 at restaurant. • Welcome drink & fruit basket upon arrival. • Admission fee to Khao Laem Ya-Mu Koh Samed National Park. - From Seeree Banphe Pier to resort at 11.00, 13,30 and 16.00 hrs. - From Resort to Seeree Banphe Pier at 10.30, 12,30 and 15.00 hrs. • One Child under 4 years old, accompany the same room with parent without extra bed is complimentary on ABF. Other meals to be charged at 50% off meal rates. All meals to be charged at 50% off meal rates. • Second child under 12 years old, accompany the same room with parents will be charged at one adult extra bed and all meals to be charged at 50% off meal rates.